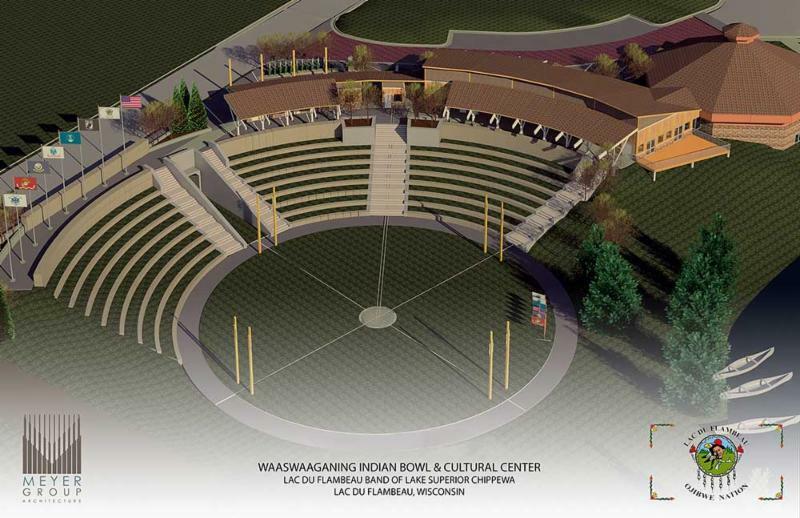 The Board of Directors of the Waaswaaganing Indian Bowl Living Arts & Culture Center is hosting a Ground Blessing at the site of Lac du Flambeau’s Indian Bowl on Monday, November 2, 2015, at 11:00 am. The Ground Blessing is a prelude to the groundbreaking planned for spring 2016, and will give thanks for the support of the project and seek blessings for the future facility. Northwoods NiiJii Enterprise Community, Inc. (NNEC) recently received a $300,000 grant for Waaswaaganing Indian Bowl construction from the U.S. Department of Health and Human Services. NNEC is a 501(c)(3) nonprofit partner of Waaswaaganing Indian Bowl and the Lac du Flambeau Tribe. The grant, together with previous funding including a $600,000 HUD ICDBG grant, $100,000 HUD funds from the Minnesota Housing Partnership, and $300,000 from the Lac du Flambeau Tribe, provides the amount needed for the dance grounds amphitheater. An additional $2 million is needed for Phase 2, which will include the Living Arts and Culture Center. The new Waaswaaganing Indian Bowl Living Arts & Culture Center will honor heritage and tradition, while providing a first-class venue for contemporary expression of living Native culture through the arts. The new Center will provide a link between the past and future by celebrating the present, and will be a place for artists to meet, exchange, and expand their creative visions. It will also serve as a mecca for celebrations and education for future generations.